As per Credit Suisse, the high-end smartphone market is currently a duopoly between Apple & Samsung. While this may not be surprising, the pace of Samsung's growth in this market is. While Apple's market share in this segment has shown a modest decline from 47% to 43%, Samsung's has surged from 2% to 39%. At this pace, Samsung should overtake Apple's market share in the $400+ smartphone segment in 2013. 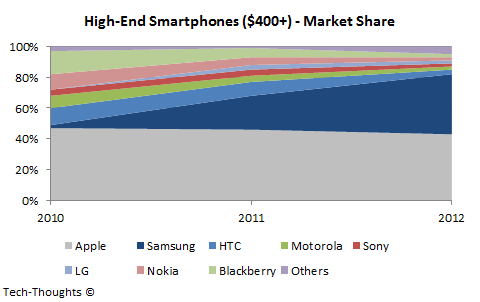 The high-end smartphone market is also the most highly penetrated and slowest growing segment in the industry. These dynamics, combined with Samsung's rapid ascent in this space, are the primary reasons behind Apple's sudden willingness to look at cheaper smartphones. As the chart above shows, the vast majority of Apple's smartphones are sold at an ASP above $500 (primarily in subsidy driven, mature markets). 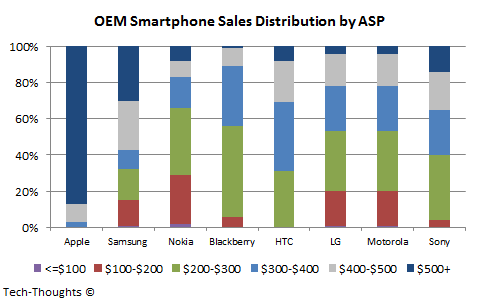 Meanwhile, Samsung is more diversified across price points, but 60% of its sales still come from the $400+ segment. Most struggling smartphone vendors, like HTC, Nokia & Blackberry, seem to be completely focused on the low to mid-range segment ($200-$400). The fierce competition in this space seems to have depressed gross margins. Also, Samsung's presence in the mid-range segment, along with its sizable marketing budget, has put further pressure on competitors to boost marketing spend. Most mid-range vendors have been pressured even further by the upward migration of low-end Android vendors like ZTE & Huawei. While this may seem unhealthy, the low-end and mid-range segment makes up the majority of the smarphone market in emerging economies. As a result, regional companies like ZTE, Huwaei & Lenovo have been the biggest winners here, overtaking erstwhile leaders like Nokia & Blackberry. With an iPhone priced at $300-$350, Apple would be putting its industry leading margins at risk, but even that sacrifice will not guarantee success in this market.